Happy Christmas, looking forward to next years visits to your delightful blog. Sweet! 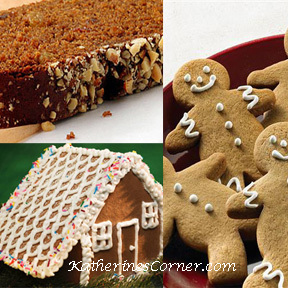 i just found a 150 year old recipe for gingerbread that doesn't use any sugar… its on Cooks.com, and its called "sugarless gingerbread"… it was yummy! I love the gingerbread men . . .
Come by my WW linky and link your post up! And our gingerbread house never looks that good! I can smell your post, yummy! Yum, yum, yum!! Beautiful too! Happy Holidays!!! Happy Holidays from The Adventures of Mommy B! !